Hazel’s striking vision – “Rise up, women” – for the Emmeline Pankhurst statue, captures the courage, determination and dignity of this extraordinary activist, as she calls on women in the crowd to rise up and demand their right to vote. The shortlisted sculptors were asked to summarise their maquettes in just one sentence. The above, is mine. It is rare to see women portrayed in public statues, even rarer for the statue to show a woman in action. Here Emmeline is an agent of change, caught mid-rousing speech, urging women from the 1900s and women of today, to rise up and demand justice. The title is from Emmeline’s autobiography, ‘My Own Story’, where she speaks of the Women’s Parliament – ‘The slogan, “Rise up, women”, was cried from the platform, the answering shout coming back as from one woman, ‘Now!”. 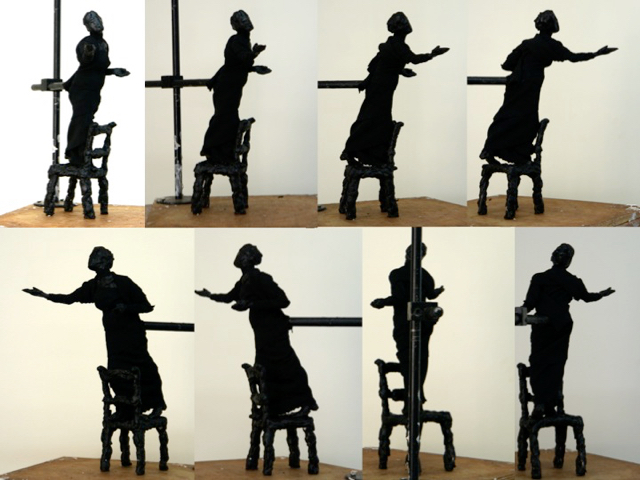 Here are the images of the black wax ‘gestural model’ I created for the first interview, along with a rough drawing. 3 Responses to "The Emmeline Pankhurst maquette: “Rise up, women”"
Having looked at the weblinks for the 6 shortlisted sculptors, I have to say that yours was the one which “spoke” to me – both artistically and in spirit. Absolutely love your Nigel Gresley statue and love your active stance for the maquette proposal. Can’t wait to see what it looks like, and I’ve got my fingers crossed that your proposal captures that complex, “difficult” woman who symbolises so much for us.